Left: Gottfried Feder, the intellectual powerhouse that gave Hitler the anti-usury agenda he needed to get to power. But he was sidelined by Schacht and never got the opportunity to implement his ideas. Clearly far from all were convinced by the analysis that Hitler’s finances were not at all interest-free. But recently some key quotes from Schacht’s memoires have come to my attention. They completely validate the basic premises of the article. As a reminder, the article pointed out a number of key issues. Hitler did not really reform the German monetary system. The Reichsmark, created by the Weimar republic, continued to be the national unit. The banks continued their operations, based on usurious fractional reserve banking. Their ownership did not change. Germany did have a national debt under Hitler. In 1938 it stood at 18 billion Reichsmark, quite a sizeable sum. Gottfried Feder was the one behind Hitler’s very strong anti-usury stance during his rise to power. But already in 1931 Hitler’s industrial backers wanted him to reign in Feder and he was completely sidelined in the aftermath of the night of the long knives. Hjalmar Schacht, aristocrat, mason, top banker, who studied Hebrew to further his career and who was a close friend of Bank of England Chief Montague, became Reichsbank president, in charge of the economy. He solved the depression, which was caused by capital scarcity due to deflation, through the MEFO bills, that circulated between industry, banks and the Reichsbank. But he did not at all solve, or even address usury. Quite the opposite. He was the one who made sure it was business a usual for the banks. The quotes from his memoires, ‘the Magic of Money’, posted here below, completely corroborate this analysis. He points at Feder and Strasser and interest was the issue. Feder’s interest-free money was ‘nonsense’ and his fight against private banking ‘destructive’. It also transpires that the MEFO bills came with a 4% interest rate. Hjalmar Schacht was the man that controlled the German economy and allowed Hitler what the Money Power wanted him to do: build an army against Russia. Below are the quotes and as an extra the relevant paragraphs from Zarlenga’s ‘the Lost Science of Money’. Interestingly, Zarlenga links Feder to Georg Knapp, who wrote ‘the State Theory of Money’ in 1905. Knapp’s thinking is known as Chartalism and later morphed into Modern Monetary Theory. I will be coming back to MMT at a later stage, it’s making a come back, but unfortunately it does not really solve usury either. Knapp was probably the link between American Populism in the Greenback wars of the 19th century and Europe’s anti-usury movement. This truly was a crucial junction in humanity’s struggle against the Money Power’s Usury. Many thanks to Mark Smith, who got to the bottom of this. This is an old newspaper snippet, concerning the arrest of Louis de Rothschild in the aftermath of the Anschluss, when Germany and Austria were united, something both countries strongly desired. 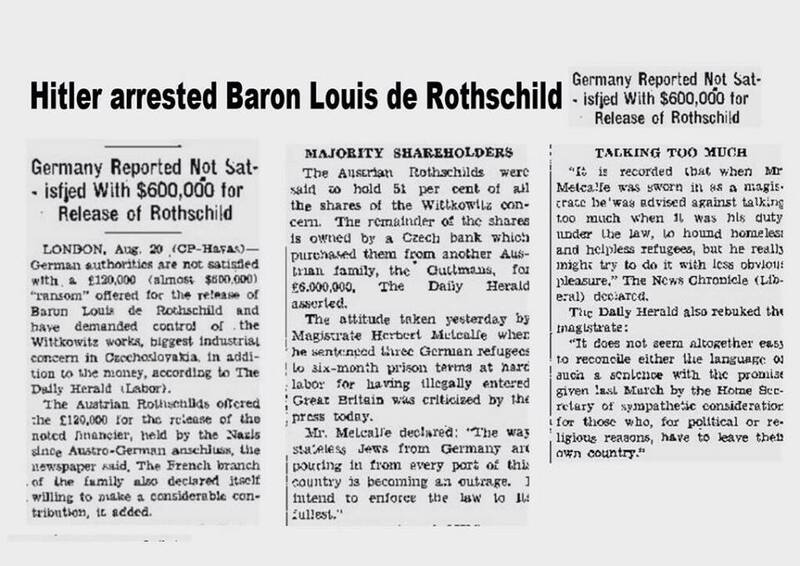 This arrest is, understandably, construed by Revisionists as proof that Hitler was working against Rothschild. But Louis de Rothschild was the owner of the Vienna based Krediet Anstalt, that went bust in 1931. This was a shock that was felt all over the world, quite similar to Lehman’s demise, which left a $700 billion crater in the heart of the financial system. At the time, like today, bankers were used to getting away with this kind of stuff, and Hitler did well to arrest him. But it was for a specific reason and cannot really be seen as particularly, let alone comprehensively, anti-Rothschild. The second method was the building of the autobahns, and already in the summer of 1933 work began with the building of the stretch connecting Frankfurt/Main with Darmstadt. As the number of employment opportunities grew perceptibly, the Reichsbank began to. grant direct loans for both these activities. A milliard was made available for the Reinhard programme, and 600 million for the autobahn. Both amounts were later paid back into the Reichsbank. The third method was the defence programme. The building of barracks and the equipping of troops brought orders to concerns spread over the entire country. As the cost of this part of the programme to secure employment for everyone was so great and the repayment period so long, the method by which credit was granted directly to the Reich could not be used here. There was too great a danger that the Reichsbank, in granting direct credit, would lose control of currency policy. A way had to be found which would ensure that the Reichsbank was able to restrict and limit the amount of money in circulation. It took us in the Reichsbank a year and a half to find a system which was suitable, and would still enable us to pursue a responsible currency policy. The provision of money for defence did not therefore begin until the late summer of 1934. The system worked in the following way: a company with a paid-up capital of one million Marks was formed. A quarter of the capital was subscribed by each of the four firms Siemens, A. G. Gutehoffunungshiitte, Rheinstahl and Krupps. Suppliers who fulfilled state orders drew up bills of exchange for their goods, and these bills were accepted by the company. This company was given the registered title of Metallforschungsgesellschaft (Metal ResearchCompany, ‘MEFO’ for short), and for this reason the bills drawn on it were called MEFO bills. The Reich guaranteed all obligations entered into by MEFO, and thus also guaranteed the MEFO bills in full. In essence all the Reichsbank’ s formal requirements were met by this scheme. It was a question of financing the delivery of goods; MEFO bills were therefore commodity bills. They rested on a threefold obligation: that of drawer, acceptor and Reich. This provided the Reichsbank with every justification for discounting the bills, and, although it was put to every test by the Reichsbank’ s directorate in collaboration with the country’s best legal brains and economists, they agreed unanimously that it was valid. The Reichsbank declared itself ready to prolong the bills, which true to the form laid down were drawn on three months’ credit, to a maximum of five years if so required, and this point was new and unusual. Each bill could thus be extended by a further three months, nineteen times running. This was necessary, because the planned economic reconstruction could not be accomplished in three months, but would take a number of years. By and large such extensions by themselves were nothing new with the Reichsbank; it was quite common to prolong agricultural bills, but an extension over five years, together with a firm declaration that such extensions would be granted, that was most unusual. Had it not proved possible to arrange things in such a way that a large part of the issued bills would be retained by the market and thus not presented to the Reichsbank, then an excessive use of the bank-note printing presses would have been unavoidable. This danger was avoided by making the bills rediscountable at any time, and by paying four per cent interest on them. Feder’s captivating ideas were about money. At the base of his monetary views was the idea that the state should create and control its money supply through a nationalized central bank rather than have it created by privately owned banks, to whom interest would have to be paid. From this view was derived the conclusion that finance had enslaved the population, by usurping the nation’s control of money. Money is a creature of the law. A theory of money must therefore deal with legal history. Near the end of that book, Knapp casually mentions how German monetary theorists of his day, and earlier, would study and discuss American monetary theories. Thus the ultimate source of Feder’s viewpoint was probably the American Populist movement of the 1870s and the ideas that movement promoted to establish a permanent greenback system. Industry did not want to put economic life at the mercy of such men as Gregor Strasser or Gottfried Feder, who, marching at the head of small property owners incited to revolution, wanted to hurl a bomb at large-scale wealth. Feder announced that the coming Hitler government would create a new form of treasury bill, to be given as credits to innumerable small businessmen, enabling them to re-employ hundreds of thousands and millions of workers. Would this be inflation? Yes, said Walter Funk, one of the many experts who for the past year or two had advised Hitler – an experienced and well-known finance writer, collaborator of Hjalmar Schacht and, in Hitler’s own eyes, a guarantee that big business would treat him as an equal… Hitler decided to put an end to the public squabble by appointing Göring to [oversee the questions]. Feder quickly lost the battle with Schacht and the German business establishment. Perhaps he was in over his head monetarily. He wrote of his monetary plan: “Intensive study is required to master the details of this problem… a pamphlet on the subject will shortly appear, which will give our members a full explanation of this most important task…”27 But this was 1934, which means he hadn’t clearly reduced the problem to written form since 1919, over 15 years. “When the time comes, we shall deal with these things in further detail…” Feder wrote, but indeed his party was in power, and the time had come. Feder was put out to pasture by the National Socialists, serving as an under secretary in the Ministry of Economic Affairs, later to be transferred to commissioner for land settlement and then completely sidetracked as a lecturer at the Technische Hochschule in Berlin. Hitler and the National Socialists came to power on January 30, 1933. Germany’s foreign exchange and gold reserves had dropped from 2.6 billion marks in late 1929, down to 409 million in late 1933 and to only 83 million in late 1934.28 According to classical economic theory, Germany was broke and would have to borrow. But classical economic theory is not very accurate. The Title of Schacht’s Book is intriguing, to say the least, This is a brilliant series of Blogs, I have reblogged before and have done so again today. This is pure Golden analysis, re-visiting after a while. Your regular readers might appreciate some of my epic political Economy Poetry on Usury. A TRILOGY IN FOUR PARTS. And My Novel, currently being finished off and possibly destined for a rewrite as an Epic Poem. Hi Anthony. Love your blog, good stuff. Can you please add a Search control on your page? Or a way to see a list of ALL your posts/history? Currently the only way to navigate your history is through your ‘categories’ section, which is full of redundant sections, and not very easy to search. Thanks man, keep it up! Thanks stuzor, good tip, added a search bar (to the right). I’m going to redo my site to allow a better overview somewhere this year. For the rest I can only suggest using the ‘older posts’ link at the bottom of the post list. – Infinite compound interest versus a finite money supply and the social suffering coming from this problem (Feder’s view). – Interest on capital is unavoidable otherwise the economy comes at a standstill, hence interest on money is unavoidable (Schacht’s view). The solution is to tax money, to restrict money supply, maximise nominal interest rates at zero (favour direct investments over credit) and let the value of the currency rise by economic growth. If the economy grows (rises) relative to the money supply, that is deflation. If the economy stays the same, and the money supply contracts, that is deflation. If the economy contracts, and the money supply contracts more, that is depression deflation. If I loan out my daughter’s old Barbie doll, I’m a creditor, and my debtor now has a Barbie loan. Our Debt/Credit contract is to pay me back my Barbie in, say, 8 months. Debtor pays back the same Barbie in the contract period, plus some clothes she made – bonus for me. The contract was non usurious as the same good came back, and the clothes came out of labor energy and the earth (cotton + sun + water). I loan out a chicken, and my chicken debtor pays me back a year later with a chicken and two chicks. Different chicken but equivalent, and the two chicks come out of labor + earth so it is non usurious. If I loan out sterile money, my contract specifies a number – let’s say 5 and that number should be paid back in so many months, etc. Money cannot grow and beget chicks, because it sterile – it is numbers. However, if the future “numbers” are deflated, then it is not equivalence. Creditor is not getting back a chicken, but instead something different. The number 5 in the future is not the same as the number 5 from the past. It is unlike types, and it is usury. The creditor really didn’t need the number 5, but they are getting future usury from the debtor due to the deflation. Labor is under pressure to sell their rusting goods and wares for cheap in order to attract scarce money. In extreme cases, labor would have to resort to extreme measures to acquire money in order to pay off past debt contracts. Creditor gets to spend the returned number 5 for more goods in the future than it was worth in the past, and all he had to do was nothing. The future deflated money (scarce) is used to pay off their past plentiful old numbers in what has become a usurious contract. Credit and Debt relations are disturbed because the economy was mishandled due to lack of sufficient money available to match economic output. Plus the credit debt contract of money, probably included interest, meaning the contract is made even harder for debtor. The interest is also paid in scarce money. But, at the time of the contract, none of this is comprehended, as people are generally trusting and they trust that our “bankers” and economists know what they are doing. There is no usury if you receive the same number of money units after some time. Deflation may not be a problem because of the demurrage. It is not attractive to keep the money so there will not be a deflationary economic contraction. Stocks pay dividend as companies make a profit, so why not invest in stocks instead of lending out money at zero percent? The proposition must be attractive so the value of the money has to rise somehow. Reality is just the way it is and not the way you want it to be. Schacht was a realist. My mission is to make interest free money work and to get interest free money out of the fringe. This job may exceed the capacity of an individual like me. It won’t be interest free if the money supply cannot flex to existing conditions. If general purchasing power (money) is not available to pay off past contracts, then it is scarce and will cause excessive demand. That demand will then allow money creditors to extract excessive interest to create new debt contracts, this even despite the demurrage. As I’ve posted here before, China is now taxing savings, a form of demurrage. Yet, they have a stubbornly high savings rate. Why? because people are worried about retirement and health care. In other words, the economy extends beyond the monetative, and into the fiscal/taxation/law sphere as well. It is a multivariable fiscal and monetary problem with interactions across time and conversions of types; this is why people argue so vehemently. But, there are certain truths and a science of relations that most people are unaware of. These truths have been obscured by usury funded propaganda.
. I also believe that stocks should be in savings instead of money, and most of your other points are correct to my thinking. But, you are way off base with the idea of deflation being good. Just trying to help, and challenge a logical inconsistency. A usury contract has one party benefiting excessively at the expense of the other. Usually the creditor benefits without taking any risk, while the debtor takes risk and has to forfeit his assets in the case of failure. Paying back old contracts with overvalued future money is usury in that the creditor benefits excessively. Just interest on money is only one aspect of usury, making future money scarce – the same effect as deflation. Money has to be scarce somehow, otherwise it will not make people live within their means. Why not lend as much money as you can and invest it if money is abundant? This is the scheme central banks are trying now. You cannot stop economic laws from operating. You cannot simply ban interest and assume it will work. This is wishful thinking that goes against basic economic laws of which many proponents of interest free money appear to be unaware. I do not think that credit should be banned, so money supply can be flexible according to economic needs. I only think there should be a limited amount of currency. Central banks may step in and help banks only at zero percent interest so banks cannot make a profit on central bank assistance. Hence, they will try to seek adequate funding in the market or not lend out at all. This type of discipline is possible because the demurrage provides constant economic stimulus. Credit as money is a unit that cycles in the economy for awhile, then returns to ledger disappear. It is an IOU that stands in as money. This unit requires a function machine to convert an asset to general purchasing power, and that function machine requires some differential (usury) and a debt instrument to operate. The differential in usury to make the machine work, is a valve the bankers operate to control volume and thus make money scarce. There is no connection to this machine and industry/labor. For example, if a bank extends credit to a manufacturer to fill the supply chain; said manufacturer will pay his employees, and some time later sell his goods. After selling, manufacture pays off banker. Once goods are sold, the credit as money is then recalled from the market, and said goods will not find the former credit as money they need for sale. In other words, labor cannot buy its own production. Real permanent money needs to be in the money supply, which is called base money. Money pays off credit but not vice versa. Permacredit, or base money, can have demurrage on it because it is a different unit, and has different behavior. With regards to scarcity, the question is for who? A two loop economy will have scarcity for labor and not for those in the upper loop have have usury flows pointing at them. Deflation in the lower loop, but not in the upper leads to Oligarchy. Before WW2, England had a scarcity of money. As war broke out their production increased three fold. Even during the war, while being bombed, they never returned to the low pre war levels. This tells us that money is demand, and some scarcity is unnecessary. Money should match production, not what some unrelated finance function machine predicates. Part of the multivariable problem is getting people to recognize that there are different money units, with different behaviors, and they flow in different channels. For example, MEFO bills had their own channels and behaviors based on their “law” and design. The other thing to must get across is that money has no relation to industry and production. Money is created by bankers, and industry distributes existing money as wages and prices are in goods. If you produce a good, and it is wanted, it may not distribute – as money is not available for distribution as a functional output due to our system bad design. I’ve always maintained that we need a fourth branch of government – a monetary authority, and we need different units in the money supply, and in proper channels. At its most basic, money is an accounting and distribution method, and the most efficient one at that. Some interest is inevitable, but with a proper system, it can be driven toward zero. The interest can be pumped into the supply to help debtors and then be recycled so it becomes non usurious. I agree, demurrage is an important ingredient, but it isn’t a panacea, and neither is interest free credit. It is a whole function muitivariable system problem that includes the law, politics, and system structure. It is a giant problem, and the most important one facing humanity. It seems a good idea to write down you thoughts in a theory. I would like to write something about “money has no relation to industry and production”. This seems crucial as it may also imply that any money supply will do. You may be able to run the world economy on one euro if there are fractions small enough. The demurrage may spread the money into the economy as the owner of the euro does not like to keep it. Managing money supply may then be a thing of the past. About a fourth branch of government you mention, I am not very fond of government managing the economy and the money supply. I try to invent a system that can operate on its own and let the markets do their job. That is not to say, that I do not see a role for government, but the idea should be that you should try to have a monetary system that can operate without government intervention as much as possible without having adverse social and environmental effects. Government is the most efficient actor in its sector. It just needs to be boxed in and contained to its sector. Small efficient government is the goal, but that can never happen with private markets, generating usury money, which then captures government – to continue the cycle. Private financial predators demean government to then capture it, to then host it for their rent seeking. Small local governments with their own money is probably an ideal. Having some competing currencies should be carved out as an exemption in the law. Sorry, money is a creature of the law. It is high agreement in small tribes, hence it can be IOU’s, as everybody knows each other. But, any large tribe must have law, and hence government. Sufficiently advanced economies, meaning large tribes, must have law and at that point money shifts and becomes social credit. A one currency is at odds with the nature of independent tribes. Only with money do we have disagreements about its true nature. It’s most advanced and true nature is the law. The system design will predicate behavior and that is just how it is. People that insist on market generated money, meaning credit creation via. hypothecations of assets into personal IOU’s to then be granted license by government are guilty of encouraging usury. There is no way a private market based system will work organically and naturally. Markets are not God, they are creatures of the law. Simple changes in the rules of markets will predicate a different output. The housing bubble is a perfect example, where Glass Steagal was broken, and predators were set loose. Everybody suffers when the social credit is perverted into financial private credit. That said, we will need private enlightened money systems in the meantime because our governments have been captured by finance. Private creditors need to bend down and admit they cannot be government, but in the mean time, they need to be enlightened and stop working toward rent seeking behavior. When private creditors suggest they have the answers, I’m immediately suspicious because the problem extends beyond the monetative. But, there is no denying that government has a role, and it needs to be constrained to its role. It’s role is to create our money and then let us use it. They can then tax it away from us for its legitimate uses, and only after they justify themselves. Justifying themselves will help keep them small, local, responsive and honest. A vertical pyramid of hidden private money power is equally dangerous to a vertical pyramid administrative state, like communism of fascism. Hidden vertical pyramids of private money power will continue to cycle us into war and debt peonage. Lack of government oversight sets financial predators loose to prey on the weak and trusting. Come on Mike. You know what your dealing with. Just look at Anthony’s pic. Ben Franklin’s Colonial Scrip System was the basis for Lincoln’s Greenbacks and apparently the basis for Feder’s money. The Colonial governments of North America, not having any gold or silver because it tended to flow away to England, began to issue bills of credit, paper notes called scrip, without issuing bonds and going in debt to private bankers. The money was backed by the public credit of the Colony. It was printed up and spent into circulation to pay for public projects and services and was loaned out …sometimes free of interest … to foster private enterprise and productivity. The trick was to issue the currency with the object of putting People to work. There was no reason for People to stand in unemployment lines because the Colony could spend money and make loans at will so as to keep People working and producing. Franklin illustrated how scrip could be created to put People to work. The work generates a free marketplace of goods and services. The marketplace redeems the Scrip and thus the wealth is fairly and evenly distributed to the workforce. Thus the economic cycle is completed without creating a public debt or maintaining a reserve of gold. It was incredibly simple and proved to be very effective. Franklin’s Colonial Scrip System enabled the American Colonies to produce bountiful wealth, giving them the power and resources to break free of British control. That is most likely why the British outlawed the Colonial currency in 1764 creating an economic depression that undermined Colonial loyalty to such an extent that the American Revolution resulted. Unfortunately for America … paying for the Revolution was a do or die situation that caused the rebelling Colonies to print scrip at a rapid pace to pay for soldiers and war supplies. This caused the currencies to inflate and lose value. It also didn’t help that the British set up presses to counterfeit the currencies with the object of completely destroying their value. With the drafting of the Constitution of the USA, the state issuance of “bills of credit” was prohibited because of the war experience. This led the way for Alexander Hamilton, whom I believe was a British super spy that infiltrated into George Washington’s circle to become the first U.S. Treasury Secretary and the author of the Bank of the United States … modeled after the Bank of England and closely tied to it. Thus ended the Colonial Scrip system … probably the best money system ever devised. I like your article very much Anthony. Great job. I enjoyed reading over Schacht’s shoulder just now. Thanks Dugan, that’s good to hear. I think many of us had lingering questions for years and it’s satisfying to sense it’s crystalizing now. “…..Feder was appointed Secretary of State for Economic Affairs when the National Socialists came to power on January 30, 1933, but his efforts to implement official National Socialist economic policy were immediately frustrated by Dr. Hjalmar Schacht, who had been appointed President of the Reichsbank in March 1933. Schacht was an enigmatic character. Although he was born in Tingleff, Schleswig-Holstein in 1877, his family originally came from Hungary. In 1903 at the age of 26 he joined the Dresdner Bank, and in 1908 he became a Freemason. A somewhat attenuated version of monetary reform was introduced. In order to finance the state’s work and rearmament programs, two dummy corporations called Gesellschaft fuer Offentliche Arbeiten (Offa) and Metallforschung Gesellschaft (Mefo) were established. These corporations accepted bills of exchange from suppliers who fulfilled state orders. These bill of exchange were then discounted at the Reichsbank at a rate of 4 percent. They were issued for three months only, which was clearly unsatisfactory in view of the long-term nature of the various projects they were financing. They could, however, be extended at three monthly intervals for up to five years. HE WHO DOES NOT LEARN FROM HISTORY IS BOUND TO RE-LIVE IT. You do realize is that key is that Feder was ‘sent to pasture’ after losing the struggle for power to Schacht? I used this article for the first about Hitler’s finances. There is more to this than meets the eye. If the Germans had been the eventual victors the debts could have been written of in one stroke. Schacht and Hitler knew this. Therefore it made sense to keep the façade of private banking in place to try keep the Bankers off his back and not have to fight on two fronts. The bankers obviously did not fall for his appeasement strategy. Giro banks are savings banks. Like a JAKS bank (I think) or what used to be “Savings and Loans” they do not make new money as credit. The state issues the money into circulation, usually on a path that improves the public commons, and then that money ends up as private savings. With Giro money banks do not really need to be nationalized, because the nature of this money is law, and hence money can be made to match the needs of the economy. Banks can remain private because the money has changed, and is now a division of the law. With public money you can have private banks. Notice the subtle straw men banker’s always erect with respect to the law. They want the law to protect their hypothecation schemes, which is conversion of assets to credit; really a conversion processes whereby special purchasing power (an asset) is converted to general purchasing power i.e. credit as money. Credit must come with an instrument – a debt instrument, owned by the banker but always linked to some law they force upon government. Note that it is always the people and their social credit – through the law, which is the ultimate guarantor of our money. Why not just make money lawful instead of a division of debt/credit? It is ours, not the banks – they have stolen what is not theirs. “The Reichsbank undertook to accept all MEFO bills at all times, irrespective of their size, number, and due date, and change them into money.” Note again this conversion process, where one type of purchasing power (MEFO) is converted to general purchasing power (money). Note here, again it is the private actors, the Reichsbank, usurping the people’s money power for themselves. Feder was dangerous because his ideas focused directly on the banker’s confidence game. So the Nazi take over of the Reichsbank was pure window dressing? The Reichsbank was already nationalized under Weimar…………Schacht had been its president under Weimar too, although I’m not sure he actually oversaw nationalization. What I am trying to work out is why bother nationalising it if it was not to thwart the private banks control i.e. window dressing. Exactly, that is the key issue. People these days talk about private central banks, but it’s an Austrian ‘End the Fed’ distraction. Commercial banking created the CB’s and create up to 97% of the money supply and rake in all the usury. Commercial banking and its usury must go, not mere ‘nationalization’ of a CB that will continue to do the banks’ bidding. So yes: pure window dressing. the reichsbank was already nationalized under jewish control under jewish Weimar… jesus Anthony are you serious? forget this magic NATIONALISED term and get to the point – under Weimar and Schact the Reichsbank kept on borrowing from jew banks absolutely destroying Germany’s economy – after 1933 the new party line was “we will borrow no more money from new york financiers” correct? that’s the point – you could nationalize the fed now and keep it borrowing funny money from jews or you could nationalize it and refuse to borrow any more money correct? The MEFO bills were a master piece for supporting the national economy. No reason to have national debt if use central bank issue MEFO bills rather than bonds. they came at 4% though………. Interest paid to your Nation is called ‘tax’. Interest paid to a private central bank issuing your Nations currency is called slavery. 4% inflation so be it. Taxes are used in theory to better the shareholders/citizens of the country. Interest to private central banks gets put on a balance sheet over and over again. To slowly be used by the bankers to BUY OUT the country they are printing for. the 4% was paid by the State to the Banks, who accepted the MEFO’s and hung on to them. For the reason as you spelled out. So it was not a tax, it was usury. Schacht made sure the banks and usury continued as never before. I just yesterday got figures of real rates in Britain, France and Germany and Germany’s rates were highest. This was caused by the upswinging economy. A shame that Feder was so hamstrung.Fractional reserve banking has been a disaster. Carr told us in 1955 that Hitler opposed the globalist bankers | What in the world is going on?